Catering for people who are fasting might seem a strange consideration for a cafe owner, but the whole foods cafe scene has it covered. 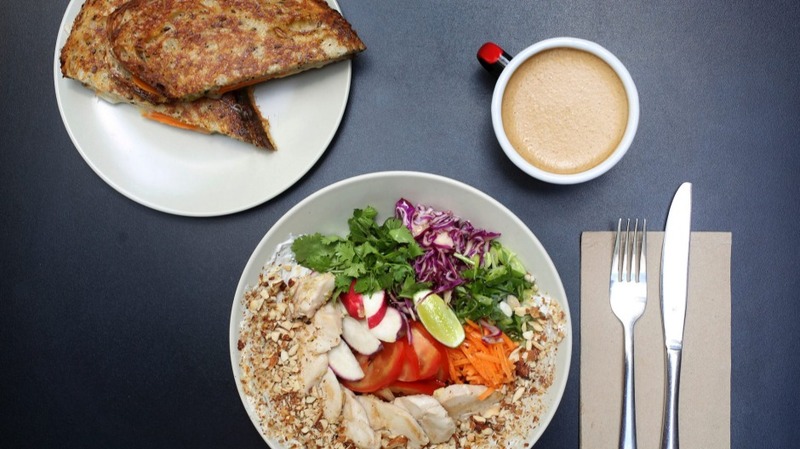 Bulletproof coffees and ultra-low calorie meals are the go-to sustenance for the partially fasting health-conscious customer. Sound like ice-to-Eskimos-level marketing genius? Head to Orwells and ask owner Laurie Holmes to explain. One year on from opening his Potts Point whole foods cafe – located in the same laneway as perennial favourite Room 10 – Holmes is continuing to expand his knowledge of fermented drinks, gut health, and pro- and prebiotics. 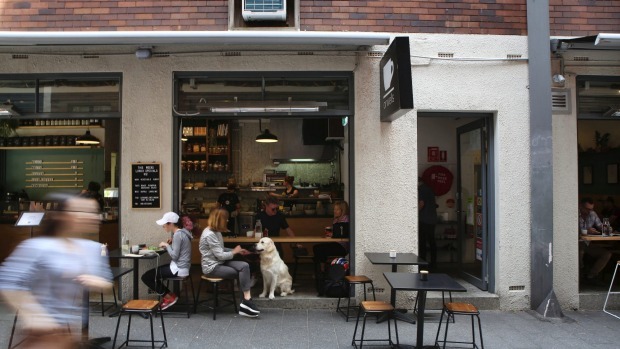 Paired with his background in the coffee industry (working with Marvell Street Coffee Roasters and as head barista at Public Dining Room Balmoral's kiosk), it adds up to a cafe attractive to both coffee devotees and kombucha curious. Joining Holmes in the kitchen is Julia Le Gouic (ex-Bentley and Public Dining Room), whose mother, in turn, was responsible for giving the pair their first lessons in brewing fermented drinks. It's a well-lit room with polished concrete floors, black-topped tables, and a huge retractable window with seats looking out to the laneway. Splashes of colour come from potted plants and the red brick wall opposite, covered with names written in chalk. The weekday crowd seems dominated by solo diners with laptops, so sitting in the cosy indoor space can feel a little as though your conversation is being transcribed. Best take those secret meetings in the lively laneway instead. 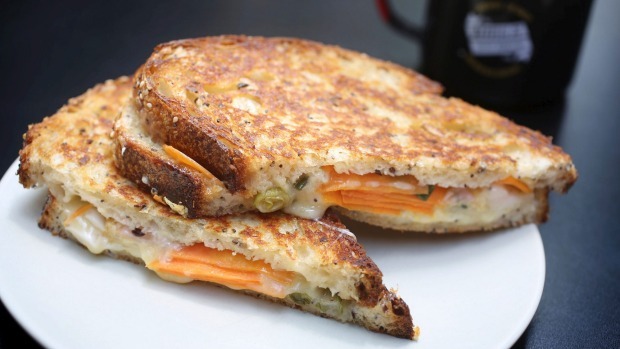 The menu is always evolving, but the "kim-cheese" toastie with gruyere and cheddar is a stayer – all crunchy where the cheese has oozed out the edges and with a good chilli kick from house-made vegan kimchi. Also house-made: yoghurt and labne made probiotic by mixing kombucha and genmaicha (green tea with puffed brown rice) in with the yoghurt, the labne served with the "avo and sprouts" dish. An aptly colourful "rainbow chicken bowl" has slices of sous-vide lemongrass ginger chicken, quinoa, veg aplenty, lime and coconut yoghurt. And "greens and grains" – one of the menu's low-calorie options – combines prebiotic greens (dark leafy veg) with black rice, herbs, dukkah, kimchi, wakame and a half avo filled with a kombucha-based dressing and sesame seeds. Baked goods brought in from various Sydney whole food bakers weren't a highlight – baked doughnuts seem either a love-them-or-don't-understand-them thing. Marvell Street Coffee Roasters supply the beans, with the sweet Daily Grind blend currently on for milk coffees, and rotating single origins for black. Bulletproof coffee – filter served with grass-fed cultured butter and brain octane oil (concentrated coconut oil said to energise the brain) – is nicely dark and not thick or oily as the uninitiated might expect. You can't talk Orwells' brews without mentioning the house-brewed fermented drinks: kombucha, kefir and switchel, the latter a maple-sweetened kombucha and vinegar drink. The flavours change regularly – next up, camomile switchel, and 16-day fermented honeybush kombucha with juniper. The brief wine list is focused on boutique Aussie drops, including vegan options, alongside a few tinnies from Wayward Brewing Company.